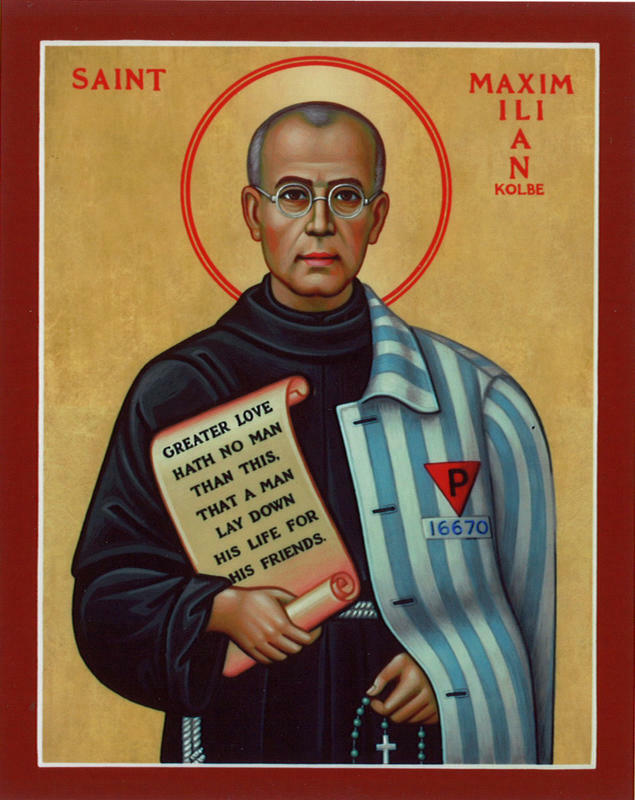 Maximilian was born with the name, Rajmund Kolbe was born on January 8, 1894 in the small village of Zduńska-Wola in the Russian part of partitioned Poland. The Kolbes were a devout and patriotic working-class family. They often made the pilgrimage to Jasna Góra where the Black Madonna of Częstochowa had been venerated for centuries, and it was this focal centre of Poland’s spirituality that would define Rajmund’s future. Like St. Francis of Assisi, Rajmund would undergo a transformation of vocation. Initially he considered joining the military, but at age thirteen, he and his elder brother Francis decided to join the Conventual Franciscans. Upon entering the Novitiate in 1910, Rajmund was given the habit and the new name of Maximilian Maria. The spirit of chivalry, inspired by a commitment to the Mother of God, became Maximilian’s guiding motto. A great leader and organizer, he wanted to transform his ideas into action. Even before his ordination, he had founded the “Knights ofthe Immaculata”—an evangelization movement that was to bring people closer to God. He hoped to convert sinners and enemies of the Church through the intercession of the Virgin Mary. By 1927, he was already building his “City of the Immaculata” at Niepokalanów, near Warsaw. It was here that he mobilized his Franciscan friars and employed the tools of the modern age to spread his message. He established a formidable printing enterprise, distributing millions of copies of his “Rycerz Niepokalanej” (“Knight of the Immaculata”), and broadcasting radio programs. Niepokalanów became a spiritual beacon for Poland, but Maximilian did not want his message to be limited to his homeland. Indeed, he hoped to promote the veneration of the Immaculate Virgin Mary throughout the world. In the early 1930s, he expanded his mission to Japan, where he established a newspaper, a monastery and a seminary. But as clouds gathered across the world, foreshadowing the horror of the Second World War, Friar Maximilian returned to Poland. Once again, he threw himself into writing, promoting family life in Polish society, and warning against the impending crisis of ideological hatred. When the war broke out in 1939, Niepokalanów became a refuge for those escaping Nazi persecution. Nobody was turned away. Almost 2000 Jews were hidden in the Franciscan friary. The leader of the Knights of the Immaculata would pay the ultimate sacrifice for his kindness. In early 1941, Maximilian was arrested by the Gestapo and was eventually transferred to Auschwitz where he was labeled a political prisoner and assigned number 16670. Even when facing the hell of concentration camp life, he remained concerned for the spiritual and physical welfare of his fellow prisoners. Then, one summer day in 1941, a prisoner managed to escape, and so the commander decided to retaliate.